Make cupcakes as directed on box using water, oil and eggs. Cool completely, about 30 minutes. Place marshmallow creme in small microwavable bowl. Microwave on High 10 to 20 seconds or until slightly softened. In medium bowl, beat whipping cream until soft peaks form. Add marshmallow creme; continue beating until stiff peaks form. Frost cupcakes with whipping cream mixture. 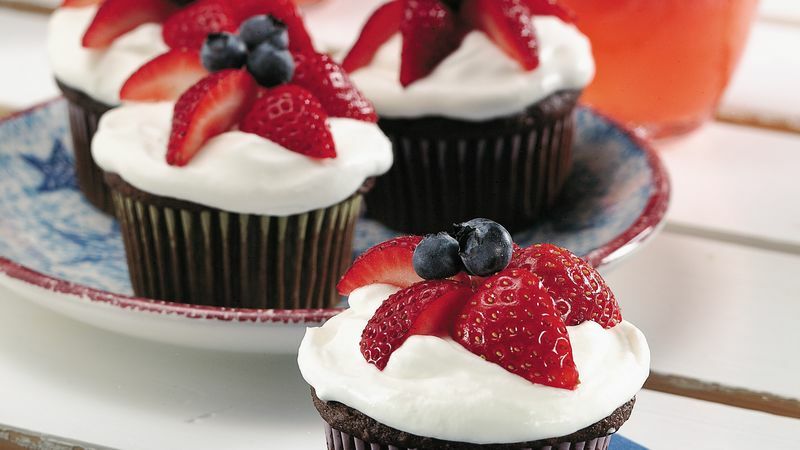 Arrange strawberries, cut side down, on each cupcake to form 5-point star. Place 3 blueberries in center of each star. Use your favorite flavor cake mix for these cupcakes. If the strawberries are large, cut them into eighths. Marshmallow creme stabilizes whipped cream; add it to the whipped cream used in other hot-weather desserts, too.